The Eternal Internet Brotherhood/Sisterhood is an independent project founded and curated by artist Angelo Plessas. It happens annually in a different place in the world which is usually an historic site surrounded by splendid nature, away from the urban grid. It is a meeting place of artists, writers, architects and various cultural practioners, a gathering offering cultural heterogeneity and exchange. In addition its a social experiment overcoming pretensions of the art-world and discuss different concerns of our post-technological life. The Eternal Internet Brother/Sisterhood, offers participants an opportunity to expand and develop their practice and proposes new relationships between people and place, between work and leisure, artist and audience. This open space in nature composed by friends and strangers, locals and visitors offers a wide range of activities such as perfomances, various workshops, writings and readings but it is a starting point for individual future projects. They key themes revolve around the effects of hyperconnectivity and solitude, re-evaluation of life in urban areas and spiritual re-connections with antiquity and other eras taking into account primarily the place and its history. The duration of the project is about 7 to 10 days. The 1st Eternal Internet Brotherhood took place on Anafi, an island with a rich ancient Cycladic culture. The 2nd Eternal Internet Brotherhood took place in April 2013 in Xilitla, Mexico in the surrealist park of Las Pozas. 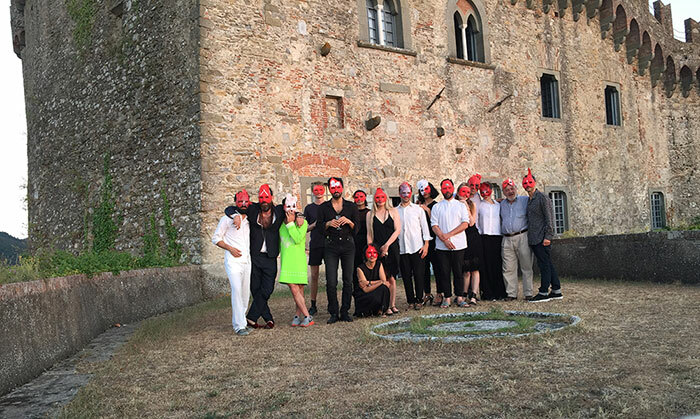 The 3rd edition happened in an abandoned military base in the North Dead Sea area in the West Bank while the 4th edition happened at the Castello Malaspina in Fosdinovo, the residence of poet Dante Alighieri during his exile. The 5th edition happened near the ancient royal palace located on the rock of Sigiriya in Sri Lanka in October 2016. The 6th edition happened in May 2017 in the pagan area of the Dornberg Nature Reserve in Germany.